Chances are your users know your brand and typed your website address into the browser directly and hit enter. Direct traffic means you cannot tie these users back to a particular Marketing Campaign or Program - paid or not. Note: If you would like to track any of the above in CAKE you can do this by using the Campaign 3rd Party Name within CAKE and appending said Third Party Name to the URLs within these materials. By doing so, the CAKE Dynamic Click Pixel will be able to read the Third Party Name and map the user interactions back to the appropriate CAKE Campaign. For more information on the Dynamic Click Pixel please click here. So, how can you track this within CAKE? If you know or notice you have a lot of Direct traffic to your website and would like to track events and conversion for those sources you can utilize Referrer Mapping within the Campaign Cards to attribute touches to this source of traffic. The Referral Channel within CAKE will allow you to track users that are referred to your website through various sources that most likely are unpaid. Typically these sources are your partners that may be spotlighting your logo or are news or finance publication pages that are sharing your press releases or other business statements. Since you most likely know these sources you can create Campaigns for them within CAKE to see exactly who they are referring to your website through the use of Referrer Mapping on your Campaigns. A good way to find these Sources if you do not have a direct relationship with them is to look at the Referrer Report under the Stats subtab > Technology Reports > Referrer. You'll want to filter this report to a Month-to-Date time frame so there is enough data to look at. In the main Channels grid under the Channels maintab, you will see a list of your available tracking Channels. 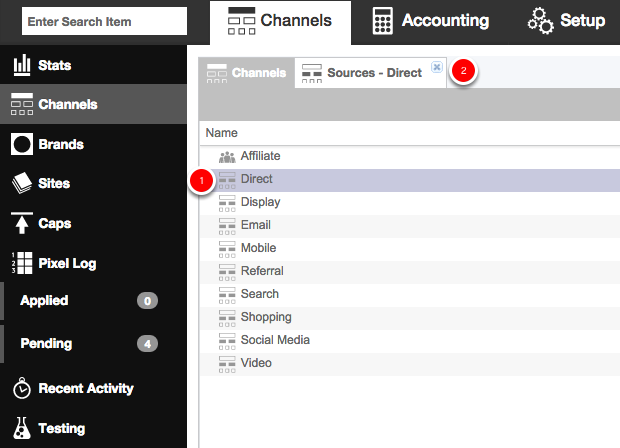 Click on the icons to the left of the Direct and Referral channel names to open each channel grid where you can add Sources. For details on how to add Sources into CAKE, please click here. Once you have created Campaigns for your Direct & Referral Sources for your Site you will be able to add "Referrers" for the Dynamic Click Pixel to map to. Note: Be sure to make this an "Active" referrer domain. How Does CAKE Read Referrers? For Referrer Mapping to be functional and track Direct & Referral traffic, amongst other types, the Dynamic Click Pixel (DCP) needs to be placed on your Site or each Landing Page you would like to track. The DCP will read the referring click and attempt to map it back to a CAKE Campaign based off of the domains added within the Referrer Mapping tab of all Campaign cards. For more information on implementing the Dynamic Click Pixel on your Site, please click here.